The controversy over one of India’s long-cherished treasures, the 105-carat Kohinoor diamond, may finally achieve official closure as government told the Supreme Court that it cannot force the United Kingdom to return the famous jewel to India since it was neither stolen nor forcibly taken away, but gifted to the British by the erstwhile ruler of Punjab. The Koh-i-Noor which in Persian means “Mountain of Light” is one of the oldest and most famous diamonds in the world. The history of the Kohinoor dates back to more than 5000 years ago. Records, including a book by seismologist Harsh K Gupta, say that the diamond was mined from Guntur in present-day Andhra Pradesh. The – not yet christened Kohinoor – diamond was first mentioned more than 5000 years ago in a Sanskrit script, where it was called the Syamantaka but there is only speculation that the Syamantaka and the Kohinoor are the same diamond because after this first written mention, for over 4,000 years the diamond is not mentioned.Until 1304 the diamond was in the possession of the Rajas of Malwa, but back then, the diamond was still not named Kohinoor. In the early 14th century, Alauddin Khilji, second ruler of the Turkic Khilji dynasty of the Delhi Sultanate, and his army began looting the kingdoms of southern India. Malik Kafur, Khilji's general, made a successful raid on Warangal in 1310, when he possibly acquired the diamond. It remained in the Khilji dynasty and later passed to the succeeding dynasties of the Delhi Sultanate. The first ‘verified’ mention of the stone came up in the Baburmama, the writings of Mughal ruler Babur. Babur acquired the rock after defeating Ibrahim Lodi, the last of the Delhi Sultans, in the first battle of Panipat. Babur was the one who described the diamond’s value equal to half-day production costs of the world. Historian NB Sen, among others, has written that from Babur, the diamond passed to Shah Jahan and Aurangzeb who protected the diamond diligently and passed it on to his heirs but Sultan Mahamad, the grandson of Aurangzeb as not a great ruler like his grandfather. ⇒ Persian general Nadir Shah attacked the Mughal emperor Sultan Mahamad in 1739 to conquer Delhi as the empire had been weakened during the reign of Sultan Mahamad. The Sultan lost the decisive battle and had to surrender to Nadir. ⇒ Nadir Shah took the stone back to Persia and it should be noted that it was him the one that gave the diamond its current name, Koh-i-noor meaning “Mountain of light”. ⇒ But Nadir Shah did not lived for long as in 1747 he was assassinated and the diamond passed into the possession of one of his generals, Ahmad Shah Durrani, in whose family it stayed for the next generation. The diamond returned to India when Shah Shuja Durrani, a descendant of Ahmad Shah, brought the Koh-i-noor back to India in 1813 and gave it to Maharaja Ranjit Singh (the founder of the Sikh empire ) in exchange Ranjit Singh helped Shah Shuja get back the throne of Afghanistan. Maharaja Ranjit Singh died on June 27, 1839, leaving the diamond and his kingdom to his sons. After three of his older sons were killed in quick succession, in 1843, 5-year-old Duleep Singh took the throne, becoming the last Indian sovereign to own the Kohinoor. The British won the second Anglo-Sikh War and annexed the Sikh kingdom of Punjab and confiscated the entire property under the Treaty of Lahore. The Koh-i-noor was transferred to the treasury of the British East India Company in Lahore. Article III of the treaty reads: The gem called the KohiNoor, which was taken from Shah Sooja-ool-moolk by Maharajah Runjeet Singh, shall be surrendered by the Maharajah of Lahore to the Queen of England. The diamond was shipped to Britain on a ship and handed to Queen Victoria in July 1850. After the diamond was handed to Queen Victoria, it was exhibited at the Crystal Palace a year later. But the Koh-i-Noor was not shiny as the other cut gemstones of that era and there was a general disappointment regarding it so the Queen decided to reshape the diamond and it was taken to a Dutch jeweler, Mr Cantor. The final product, which took 38 days to achieve, shaved off significant portions of the stone, reducing its weight by 42% from 186 carats (or 37.2 g) to its current 105.6 carats (21.12 g). Bearing in mind the myth surrounding the stone, Queen Victoria left in her will that the Koh-i-noor should only be worn by a female queen. 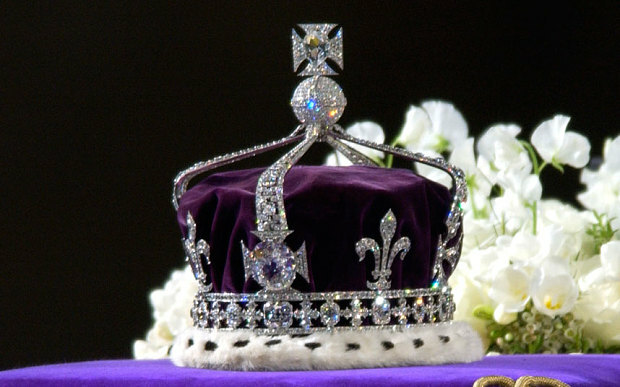 If the head of state was a man, his wife would have to carry the diamond.The stone was then added to the crowns of her successors and stowed away in the Tower of London where it has been ever since. Conclusion : The return of Kohinoor diamond to India has been a long-standing demand, with many claiming that the diamond was taken forcibly. The fight to get back the diamond has been ongoing since India's independence. Many Indians demanded the return of the diamond when Elizabeth II made a state visit to India to mark the 50th anniversary of India's independence from Britain in 1997. It is not just India that is claiming ownership of the diamond; the list includes Pakistan and Aghanistan, too. Take a short quiz and evaluate your factoid ! !